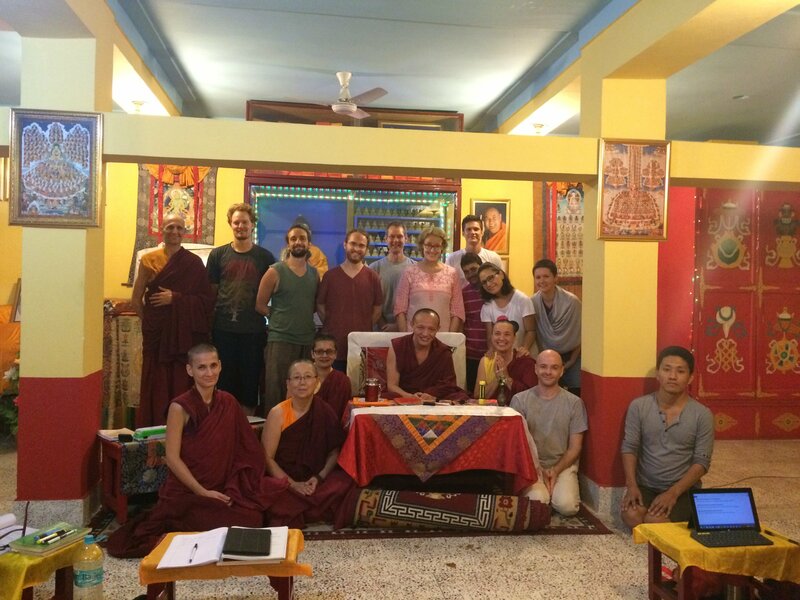 Preparations for the 2017 Kalachakra and an update of our 2016 season. Season's Greetings and Happy Lama Tsong Khapa Day to all our kind sponsors and well-wishers all over the world as we come to the end of another eventful and fruitful year at Root Institute! Root Institute has been busy preparing to host our most precious holy Guru, Kyabje Lama Zopa Rinpoche and many other Rinpoches, Geshes and FPMT sangha and lay folks from all over the world for the upcoming Kalachakra initiations and teachings by His Holiness the fourteenth Dalai Lama which will take place January 2017 in Bodhgaya. Under the very capable and competent guidance of our new Grounds Keeper, Gabriel Forer, the second director of Root Institute, specially sent by Rinpoche to help during this time, RI is undergoing a physical transformation that is beautiful to behold. Many of our old buildings both on RI main campus, and the clinic, school and orphanage and our three major social service projects, have received much needed maintenance work and fresh paint. The holy objects on the main campus have been transformed with beautiful colors and lights. The flower gardens are beginning to blossom. We have new signs outside and inside RI. Our main gate has received a major face lift with freshly painted auspicious signs that will purify eons of negativities as we pass through! 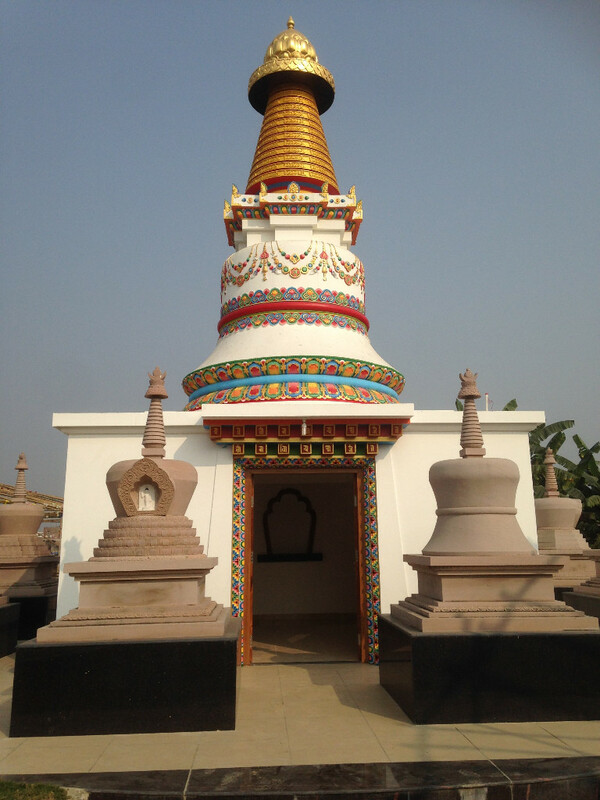 We are also delighted that our Stupa Garden of Compassion (SGC) located on a block of land about ten minutes from the main campus is also almost complete. The Kadampa stupa looks magnificent surrounded by the eight smaller stupas. On this beautiful land we will be hosting over 120 guests in tents from all over the world for the 2017 Kalachakra. The ceiling of the shrine room beneath the stupa still needs to be painted with sacred mandalas and we also need to get the main statue for the shrine room, 1000 Arm Avalokiteshvara. The building next door that serves as a retreat facility is complete and has been painted and beautifully furnished. It opened its doors to the public in November. The organic garden now provides fresh vegetables and beautiful roses and marigolds for RI. Our goats, cows and Tashi our guard dog are all happily settled in SGC. We will be holding our first retreat at the end of the Kalachakra in mid-January, a post Kalachakra retreat lead by Rachel Ryer at SGC. We look forward to hosting many more retreats in the years to come. If you would like to contribute to any of these projects please find enclosed the Christmas wish list for Root Institute. 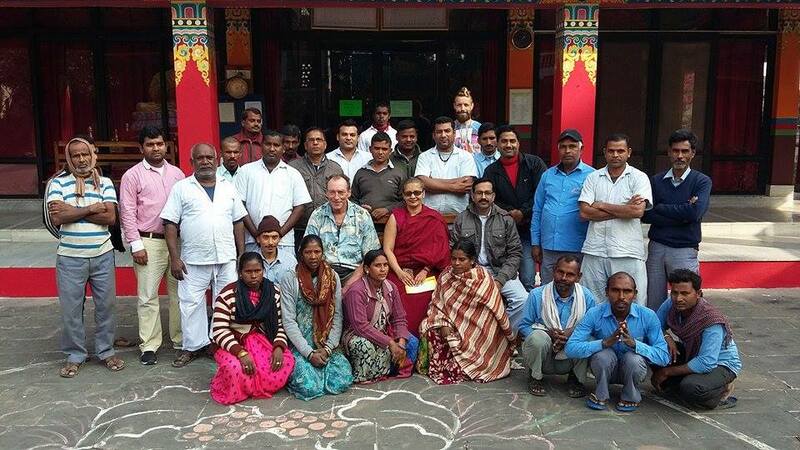 In addition to the physical transformation we are delighted that Root Institute now provides its residents and visitors from all over the world the opportunity to preserve the Nalanda tradition through the study and practice of Buddhist meditation and philosophy to transform their minds and hearts. 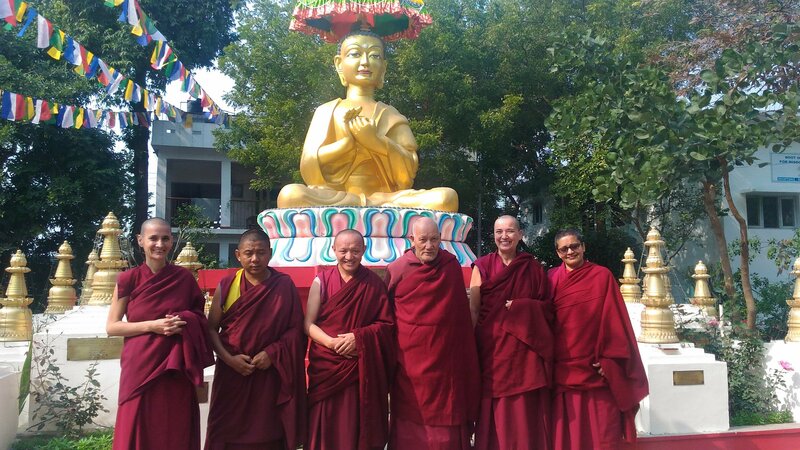 Our residential FPMT Basic Programme, the first of its kind in India, successfully completed its first two modules under the capable guidance of our most excellent resident Lharampa Geshe - Geshe Rabga. Moreoever we had several learned and inspiring scholar-practitioners visiting and teaching at Root Institute as part of our general spiritual programme.. In September of this year we started the first residential FPMT Basic Programme at Root Institute with our residential Lharampa Geshe Rabga. We have a very enthusiastic group of 9 students with two more joining in January 2017. Students will take a break during the Kalachakra period and we will be resuming the next year’s programme with Middle Length Lam Rim. Geshe Tenzin Zopa then taught on “Bodhicitta & Emptiness” and also visited and gave talks to our children in the Maitreya School, Tara Children’s Project, to the staff at Shakyamuni Buddha Community Health Care Clinic, to our local Root Institute staff – and visited Maitri, the animal sanctuary and blessed all the animals there! We also had a pilgrimage to Vulture’s Peak and the Mahabodhi Temple where Geshe-la conferred the Bodhisattva vows and several oral transmitions. At the end of October and in November we had Venerable Lobsang Namgyel giving our introductory courses “Experience Buddhism at the Root”. 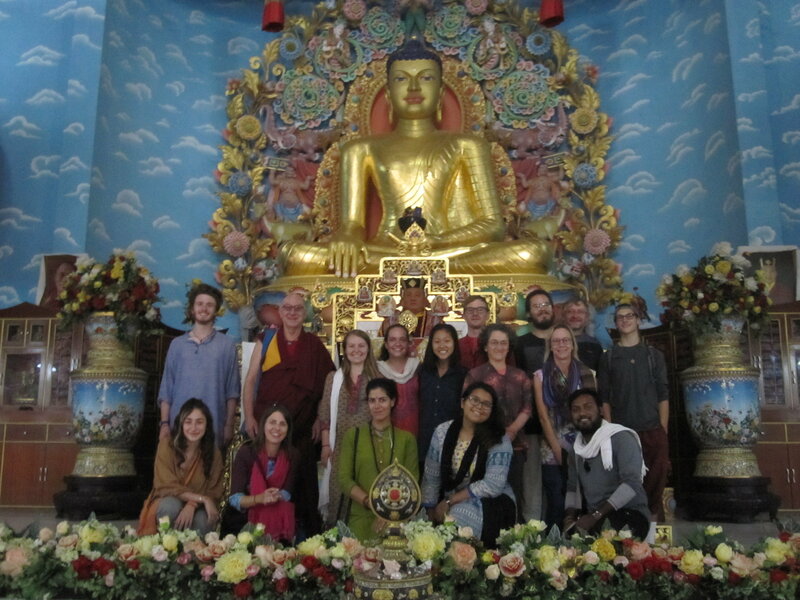 The November group did some pilgrimages including Mahakala Cave, and in Bodhgaya visited the Metta Buddharam temple, the Bhutanese Temple, the Tergar Monastery and others. Students were very pleased with Venerable Namgyel’s explanation of the Buddhist psychology, his interaction with them and his humor. Then we had Venerable Robina, with her very special style of teaching, sharing with us how to ‘Working With Strong Emotions”. 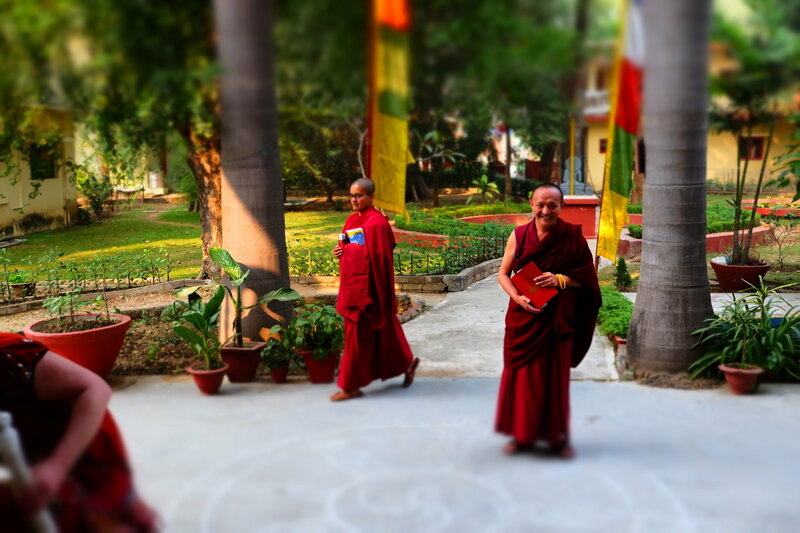 At the end of the month Geshe Dorji Damdul blessed us once more with his very profound “Bodhicitta Retreat”, leading even the morning sessions and allowing many time to discuss challenging and complicated aspects of the subject matter. Some of those sessions took place at the Mahabodhi Stupa. Our resident Geshe Rabga finished the month with an introductory course “Taste of Buddhism”, we had a very nice group that bonded very quickly and were very impressed with Geshe-la’s teachings. For the new year’s eve period and prior to His Holiness Kalachakra empowerment we will have Sibel Kavunoglu leading “Harmony in Kalachakra” retreat for those interested in understanding more about the Kalachakra system. 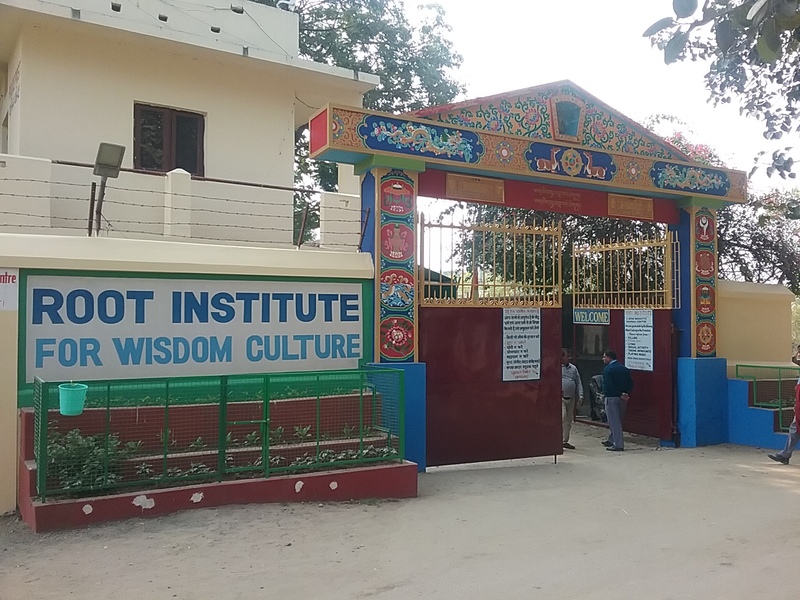 Besides the spiritual programmes, Root Institute is happy to be accomplishing its mission of serving the underprivileged community in Bodhgaya and the neighboring areas through its three social projects. 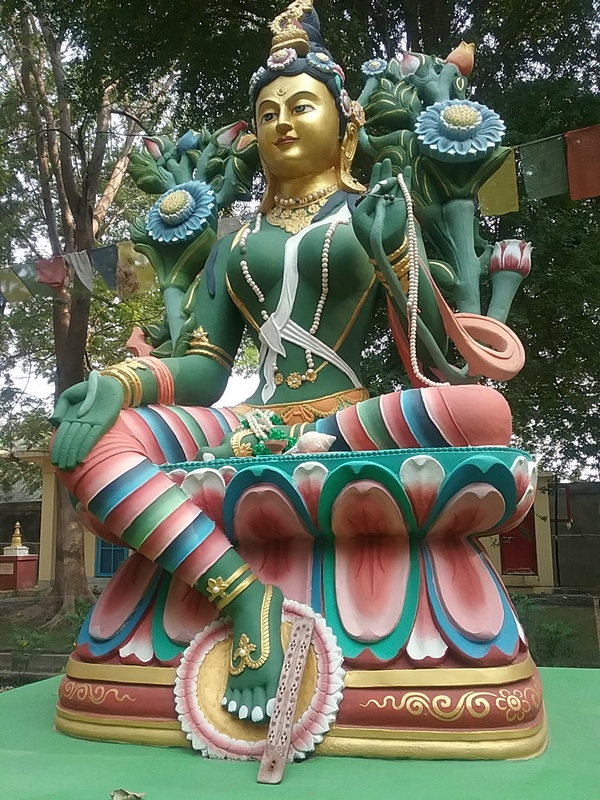 The Shakyamuni Buddha Community Health Care Clinic (SBCHCC) has not only continued to provide service to the poor at the clinic located on RI campus; they have expanded their outreach to several villages that were in desperate need for care. 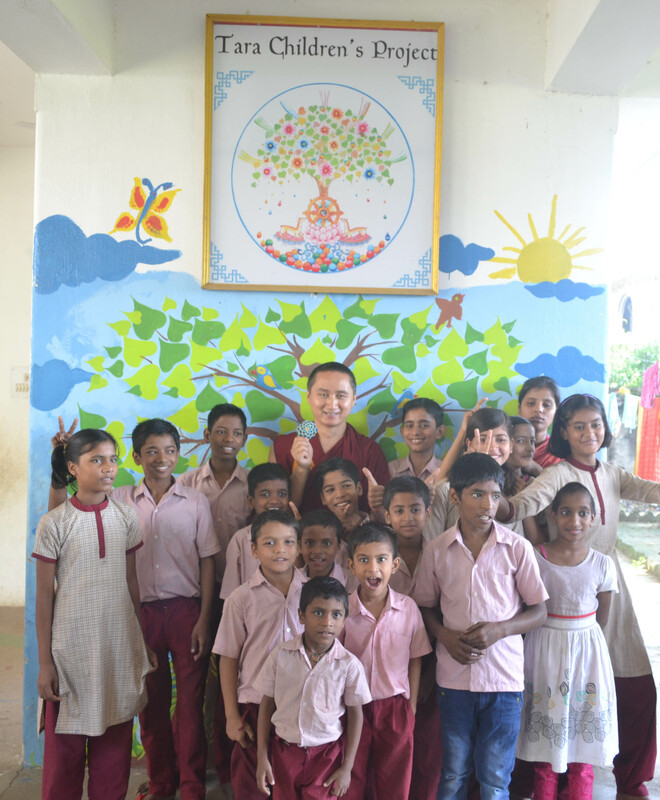 We are delighted to have a new team in charge of Maitreya School and Tara Children's Project - Mr. Bipul Kumar and Apeksha Poojary. Our children and adolescents are developing healthy bodies and happy minds. Please find enclosed the Christmas wish list for our three projects. The smooth administration and running of RI and its three social projects is the result of the hard work of volunteers from around the world. 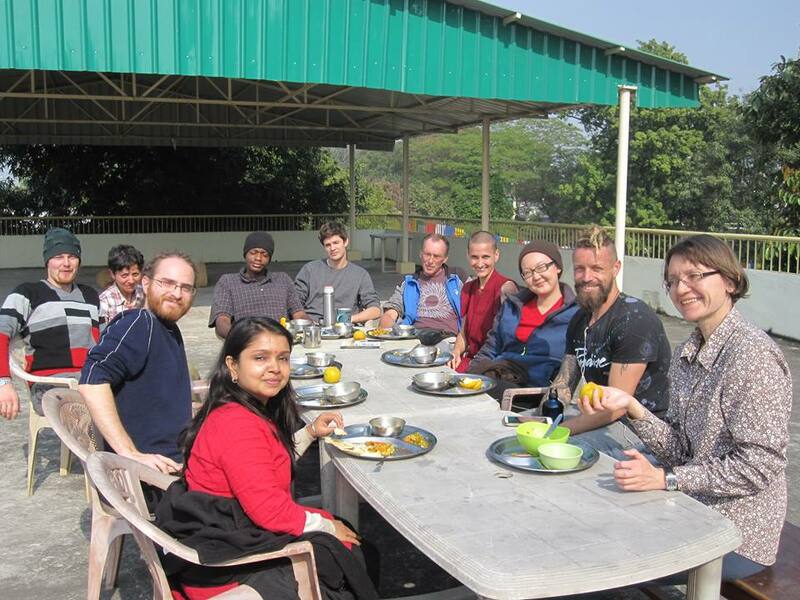 Here are some of them from Russia, England, United States, South America and India enjoying their lunch on the rooftop on a sunny afternoon. We are now honored and privileged to have three resident Lamas - Ladakhi Lama the long time assistant of Khunnu Lama, our Lharampa Geshe from Sera, Geshe Rabga and a Lama Gyupa from Kopan, Angdawa, living at Root Institute. 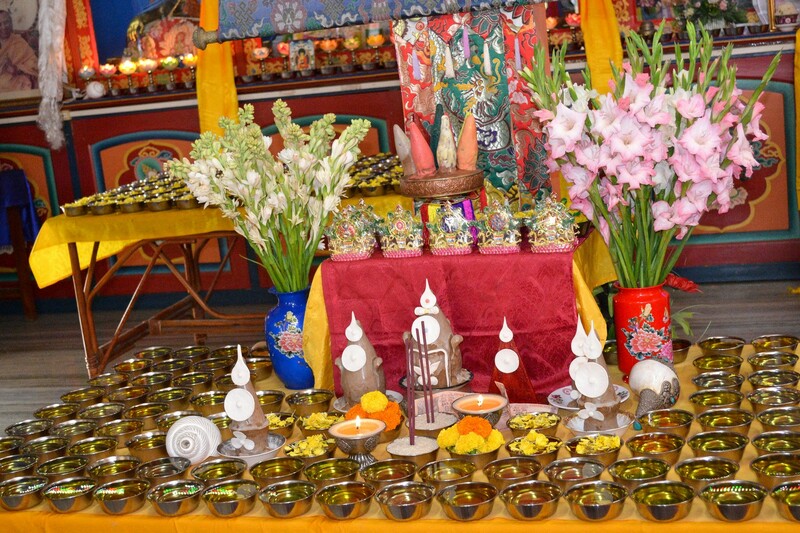 The Sangha community make monthly puja offerings including Guru puja, Tara puja, Medicine Buddha puja, Protector prayers, sutra recitations, light offerings, and offering of robes to the Shakyamuni Buddha statue at the Mahabodhi stupa. 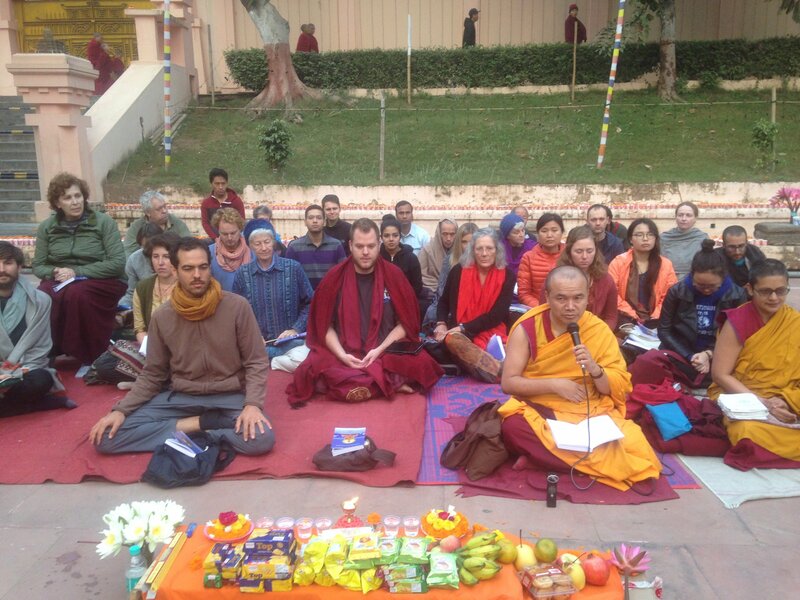 Daily sur, tea and light offerings are also made by the sangha. 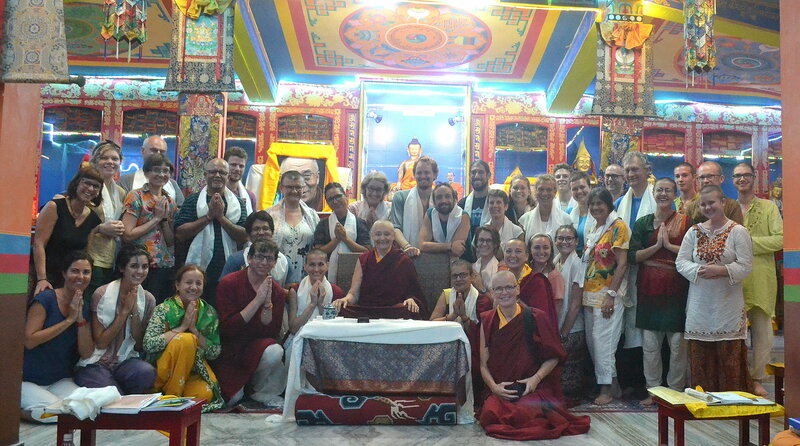 In addition the sangha participate in the bi-monthly sojong ceremony held by the monks of Namgyal Monastery in Bodhgaya. The monks also kindly give our sangha the opportunity to participate in their annual rains retreat. As one of the Indian staff member commented to me recently, "Madam, Directors come and go, volunteers come and go, it is the Indian staff who have constructed and maintained the current infrastructure!" The Indian staff have remained consistent, loyal and faithful to RI over the years. They have been responsible for the construction, repairs and maintenance of all the buildings and rooms, for tendering to our beautiful lush gardens and trees, for providing nourishing, flavorful food to all the residents, for chauffeuring us around town as and when needed and for managing our main office impeccably. Several of their children attend Maitreya School and also receive medical care at our clinic. 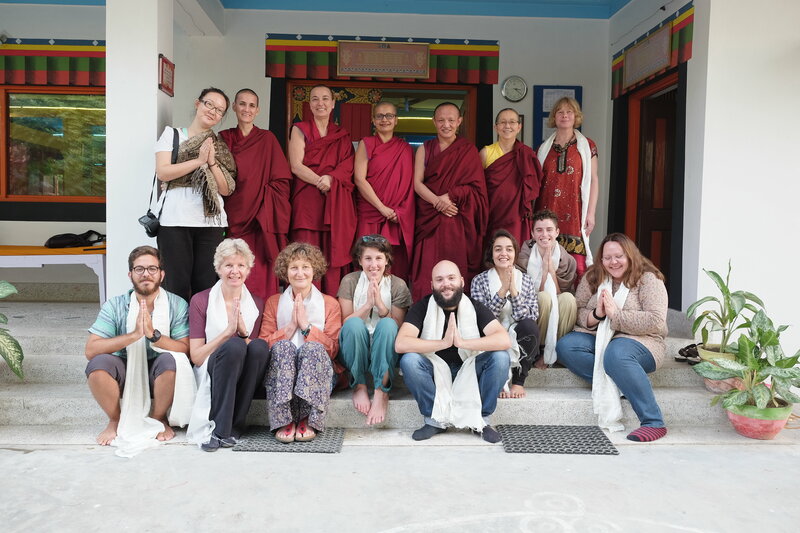 They have been working hard getting Root Institute ready for the Kalachakra under the compassionate and competent guidance of their new Grounds Manager - Gabriel Forer. ANIMAL WELFARE PROJECT - animal liberation or reproduction!!? Whenever possible we liberate animals targeted to be killed. We look after the welfare of animals by providing them with clean, spacious housing and nutritious food. As per Kyabje Lama Zopa Rinpoche’s instruction we also paint the roof of their houses with specific mantras to bless and purify them. 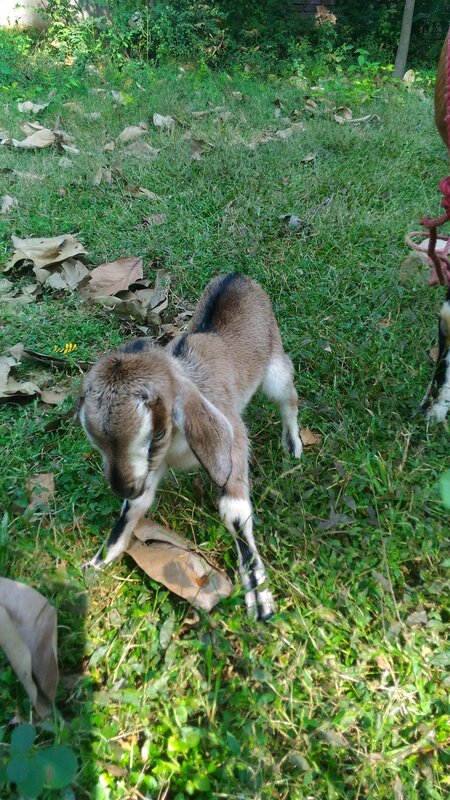 Our goats have, however, have chosen not to follow the celibacy policy at Root Institute and instead have been reproducing! Yeshe pictured below is our latest addition to the Root Institute family! That is all the news from Root Institute for now. If you would like to “accumulate skies of merit” as our most holy precious Guru Kybaje Lama Zopa Rinpoche likes to say by supporting any or all of our projects described above OR if you wish to make a one time donation towards the Kalachakra preparations underway OR contribute to our wish lists please do so by clicking on the Donate Button on our website: www.rootinstitute.ngo and checking the appropriate project. We wish each of you a Blessed, Happy and Healthy New Year and we pray that all obstacles to your quick enlightenment for the benefit of all sentient beings are removed. We look forward to seeing and serving you at Root Institute in the New Year. Practice generosity and accumulate skies of merits! You can help fulfill our most Precious Holy Guru's vision for Root Institute by making a donation of any amount through our website. Copyright © 2016 Root Institute of Wisdom Culture, Bodhgaya. All rights reserved.